Aren’t scrambled eggs just scrambled eggs? How can you make them better or worse than what they are. Do I really need a recipe? Again, aren’t scrambled eggs simply that: eggs that are scrambled? Yup, I used to think those things too. I would have laughed at someone if they had tried to post a recipe for scrambled eggs, let alone make the audacious claim that they were the best in the world. Until a little thing called serendipity came my way. I like to add a touch of milk to my scrambled eggs. To do this, you can’t really add it in the pan; you need to whisk it all together first and then pour it into the pan. One day I decided to just let my blender do the job for me. I wasn’t expecting superior results from the blender; my motive was pure laziness! But then magic happened and I ended up making the best batch of scrambled eggs ever! While this was good news for our family and for you, dear reader, who now knows the secret to making the world’s best scrambled eggs, this was not good news for my husband. You see, prior to this serendipitous event Jeremy was the primary scrambled eggs maker in our house. It was his thing. He had two things that he made better than me: eggs and popcorn. Then I just swooped in and took eggs away from him. Sorry, not sorry (sheepish look up to the left!). 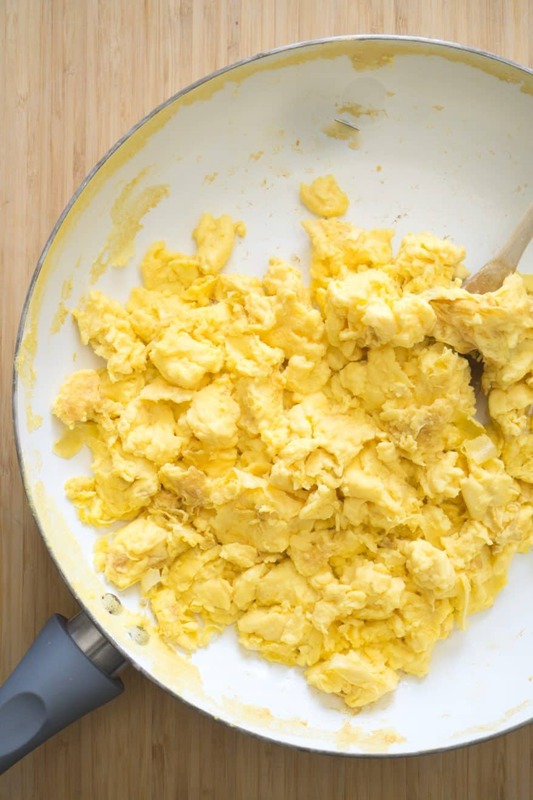 what makes these the world’s best scrambled eggs? So far I’ve just told you they’re the best, and I’ve told you how I make them, but I haven’t provided you with any evidence as to why they’re the best! And as a Dietitian, I’m all about the evidence! Can you think of any better descriptor for scrambled eggs? In the past my eggs have always been so heavy and dense. They just sat there on my plate like little bumps on a log. Just kind of meh. But these are heavenly! They are so light and FLUFFY! I use a combo of whole eggs and egg whites in this recipe. My purpose with this is to balance getting the flavour and nutrients only found in the yolks while boosting the protein content with the whites. 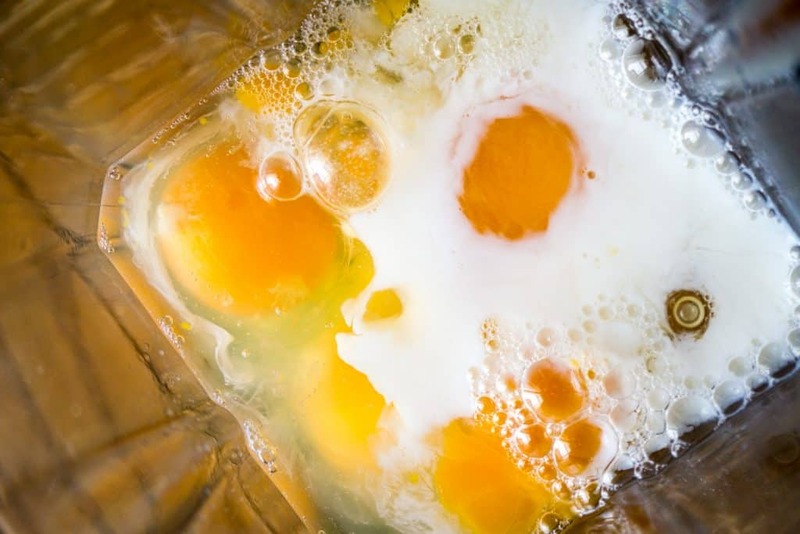 If you don’t have a carton of egg whites on hand, you can also substitute in 4 extra eggs in place of the egg whites. 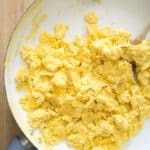 Light and fluffy perfected scrambled eggs. Place all ingredients in a blender. Start on low then turn up to high speed. Pour into preheated pan. Stir with a wooden spoon, scraping the bottom as you go, until all the eggs are cooked. If you like browned bottom eggs, fry a little longer. We really like cheese on our eggs so once they are cooked I will often grate some cheese on top and let it melt before serving! what type of oil do you use in the pan to cook the eggs, olive oil or butter? Any type of fat will work! I usually spray in a little canola oil. And if you have a non stick pan then you don’t need to put any oil in at all. Soooo good and soooo fluffy! My kids all loved it, even the one that “doesn’t like eggs”. Made it again today, as per their request. Oh wow, that’s the biggest compliment when kids “who don’t like it” request it! I discovered this by accident too. Although used an immersion blender, and it was for french toast. Soon I was using for scrambles too. Also learned from a chef to incorporate a few tiny pieces of butter after blending in place of oil. I’ll have to try the butter idea next! I have always added milk to my scramble eggs. 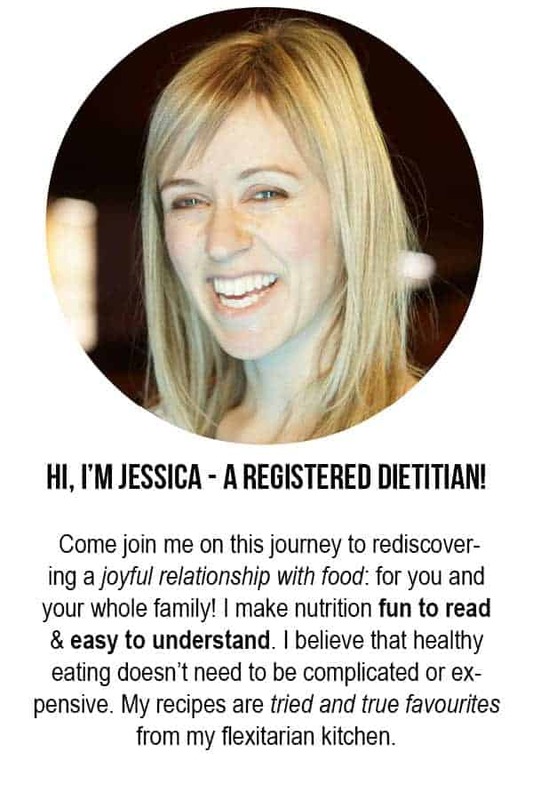 Do you use whole milk or low fat milk in your recipes?